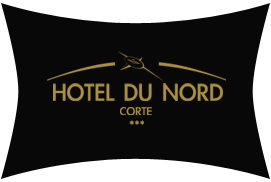 The Hôtel du Nord is located in the centre of Corsica. We welcome all locals and visitors of Corte, this charming hotel remains popular for its authenticity. The Hôtel du Nord was founded in 1861. Although we made some renovations, we kept the hotel’s originality; the key to its good reputation. The Hôtel du Nord welcomes you in a location full of history. We are located at 1 hour from the port of L’Île-Rousse. As our guest, you will find all you need to recharge your batteries, in total tranquillity. In addition to the atypical personality of our hotel, all the wonders of the city will become memories you will cherish forever. Access to our hotel is simple; you will be a mere stone’s throw from the shopping streets, the Museum of Corsica or the famous Citadel. You will also be charmed by the scenery of the Restonica and Tavignano valleys. You will be able to make the most of the city. For your bookings or for additional information.